A joint Austrian and Slovenian visa application centre was opened in Erbil today that will allow Iraqi citizens to directly apply for a visa to visit Austria, Slovenia, and other Schengen countries. Anton Pirih, Head of the Visa Section at the Slovenian Ministry of Foreign Affairs, and Dr. Mustafa Ramazan, Representative of the Kurdistan Regional Government to Austria. 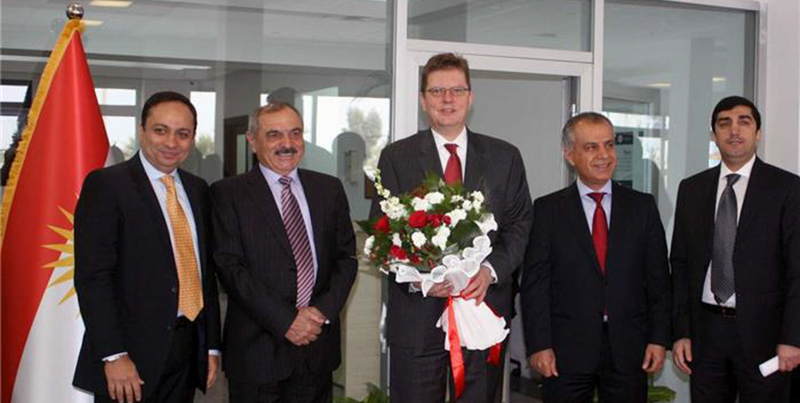 The usefulness of establishing such an office had already been stressed during a visit of former Austrian Foreign Minister Michael Spindelegger to Baghdad and Erbil in November 2011, as Austria currently has no diplomatic representation in Iraq due to the difficult security situation in the capital and is instead represented by the Austrian embassy in Amman, Jordan. The new visa application centre in Erbil will therefore greatly facilitate the visa application procedure for Iraqi citizens and residents of the Kurdistan Region in particular. Individuals were previously required to personally travel to the Austrian embassies in Amman or Ankara in order to file their visa application. While the centre itself will be run by VSF Global Group, the leading service provider in the field, all visa applications will continue to be processed by the Austrian embassy in Amman. More information regarding the application procedures and the location of the application centre in Erbil can be found here.